A man alone with himself sometimes has only one's mind to fear. Though sometimes the risk of drowning at sea cut off from all communication with the rest of humanity enters into it as well, even if there's not a giant CGI tiger to make things extra complicated. 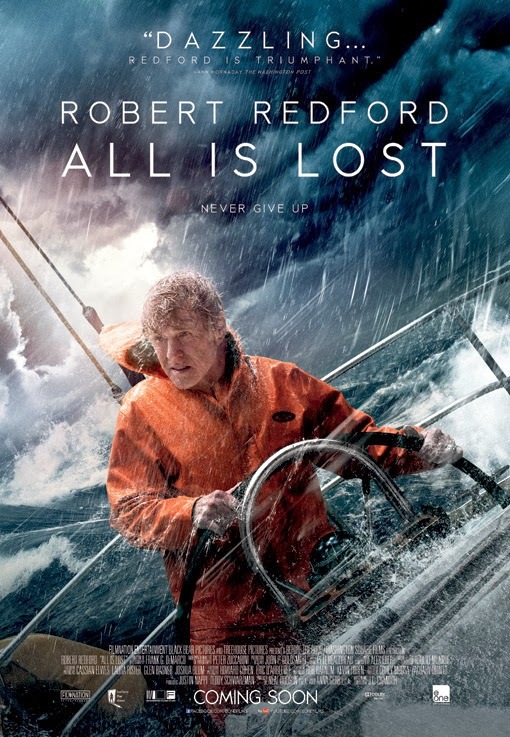 Robert Redford is such a man adrift, alone with solely himself to rely on as the open ocean and fates toss him about as a plaything. Little background about him is given as the audience is taken along as he attempts to survive his ocean going yacht being struck by a loose shipping container. In a nearly dialog free picture Redford delivers a deeply engaging performance, truly becoming a seasoned and calm mariner pushed to the breaking point. 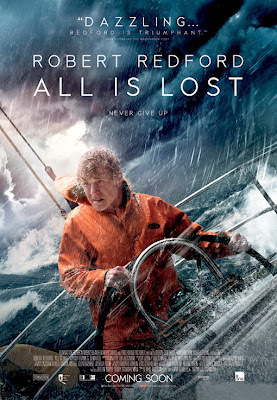 All is Lost is a worthy challenger to Gravity in this Oscar season's category of mankind against the elements pictures. It manages to to thrill and educate while presenting an intensely human portrait of a man running out of options and bearing almost all of it with the patience and determination of Job. What I loved most about All is Lost was the decision to tell very little but show a lot. The opening moments of the film largely are presented as the conclusion of the tale, with a letter read aloud offering apologies to family and loved ones for sins unstated. Quickly we jump back to the start, Redford alone on a sailing yacht awoken by a bump and water running into the cabin. He's clearly an old hand at sea. Rather than freaking out he preternaturally calmly investigates what looks to an outsider as a huge freaking problem. In that the the ship has been struck by a large shipping container. Causing sneakers to spill from the container and water to run into the boat. This begins a surprisingly restrained, but high stakes battle for survival as Redford uses the constrained resources available and his brain to try and escape from harms way. With all his energy focused on problem solving nary a word is spoken, but you'll barely notice that until it's over. Sea (a opposed to outer space in the similar but more visually banging Gravity) doesn't reward chatter boxes. Practically the entire film relies on Redford's ability to convey inner state through face and movement. Delivering a powerful performance that's emotionally engaging Redford is a sure thing for a best acting nomination this year - if there's any justice in the film world. The filmmaking visually complements his performance switching seamlessly from the confines of the cabin to the vastness of the sea at just the right moments. I'll say no more other than this is a work that deserves to be seen on the large screen. Actually, perhaps deserves to be seem more than once as knowing how it turns out will free viewers to discover what I expect is a second level of richness in the performance. Maybe leading to a more definitive answer as to how it ends. Even though most folks I've spoken with saw it as cut and dried I'm not quite as sure. Oh, and if you are going sailing at sea I've definitely learned that investing in maybe a couple extra satellite phones might be worth it. Just saying.